Custom fabricated metal privacy screen. Horizontal design to keep with existing fence. 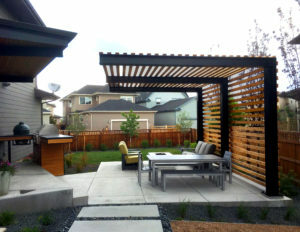 The natural wood and steel pergola with screen wall provide shade as well as privacy, transforming the space into an outdoor living area for family and friends. Spring is here! Spring is a beautiful and fun time here in Colorado. Warmer weather is rejuvenating, everything is suddenly green, colorful and growing. Design an area for family and friends to relax and gather, like this Custom Steel Pergola with canvas canopy turning this space from drab to FAB! Make your outdoor living space look and feel more inviting. 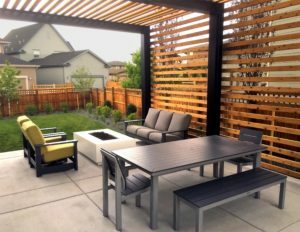 Adding a custom designed pergola defines the area of your outdoor living space. An excellent feature to accent a focal point in your landscape. A pergola might be the perfect finishing touch for your space! Not only do Custom Screens bring an artistic element to your outdoor space, it lends privacy to your gathering space, helps shield from wind and blocks the afternoon sun, and they look great! Here is an amazing custom modern water feature in the Highlands neighbor hood of Denver. We created this unique architectual privacy wall using a muittude of diffrent materials like integraly colored concrete and patinated steel. The textured concrete piece was made by using wood forms and we grinded the water trough to expose the aggregate to add interest and distinction with the other architectural elements. The custom steel panel adds a scuptural component to the piece and creates a beautiful contrasting backdrop to the plant material below . This custom water feature not only adds privacy to this outdoor living space , but it also serves as the main focal point of this landscape. Outdoor spaces are wonderful for gathering, relaxing, reflecting and dining. This modern space in the Stapleton neighborhood of Denver intergrates the architecture of the home, its clean lines and acute angles help the area become an extension of the home. The custom wood and metal screen adds privacy and sets off the space with its contemporary look. The decorative concrete wall with Ipe bench is a perfect place to gather around the fire pit to rest, recharge and converse with family and friends after a long day.